Early Childhood Australia is backed by over 50 years of both producing and offering innovative and essential early childhood materials. 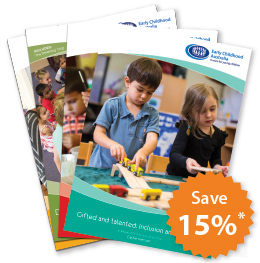 Publications are quality assured, up to date and written by experienced early childhood professionals. The Early Childhood Australia Shop also offer and large number of quality assure a large number of Publications and resources. Specific Professional Development resources can be found here. The Research in Practice Series is a practical, easy-to-read resource, offering effective new approaches for those challenging issues which arise in the care and education of young children. These books are an essential resource for those involved in the early childhood field, containing content which is both idea-rich and to-the-point. For practical advice from early childhood experts and practitioners subscribe to the Research in Practice Series today! Aimed at early childhood educators, students of early education, beginning practitioners, parents, grandparents and carers the Everyday Learning Series provides wonderful suggestions about how to create positive learning environments for young children. The books draw upon the endless possibilities offered by everyday experiences. By ‘making the ordinary, extraordinary’, the Everyday Learning Series is an invaluable resource for parents and carers of young children. The Everyday Learning Series focuses attention on the everyday ways in which young children—babies, toddlers, pre-schoolers—can be supported in their growth and development. Subscribe to Everyday Learning Series today.